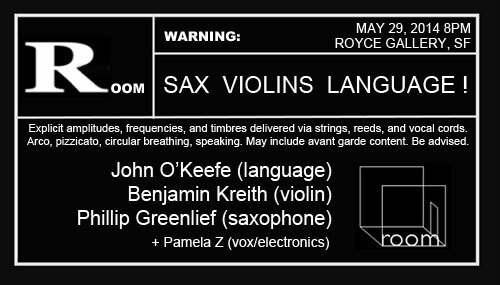 5/29 ROOM: Sax Violins Language! The double-edged sword of change always seems to cut off access for some while simultaneously carving new avenues of creativity for others. I feel very fortunate to be among those who continue to thrive in this local and global contemporary music and performance community – surrounded by so many great artists doing inspiring work, and receiving so much generous support and feedback for my own work – even as the neighborhood and the world around us is changing so quickly and radically that we can barely keep up. It’s been quite the embarrassment of riches in the collaboration department for me this year. 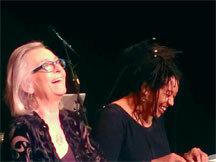 Joan La Barbara was here in March, and we did a duo concert on the ROOM Series that was just pure joy for us. We enjoyed the collaboration so much that we’re working on mounting the concert again in New York early next year. Then, I set out to finish (v)erzählen, my commissioned work for the San Francisco Contemporary Music Players–scored for voice & electronics (me), percussion (the illustrious Maestro Stephen Schick) and tape (using the voice of said illustrious maestro). I had the honor of premiering the work with Steve on the Contemporary Music Players’ Sweet Thunder Festival of Electroacoustic Music in San Francisco last month, and then we got to perform it again–just over a week later–for the music department at UC San Diego. I also attended the San Francisco International Film Festival screening of Fat Chance, a short film (by Jeanne Finley in collaboration with Mel Day) for which I composed the score and did the narration. It was nice and quite surprising to see/hear it with fresh eyes/ears after such a long interval from the time when we were working on it. 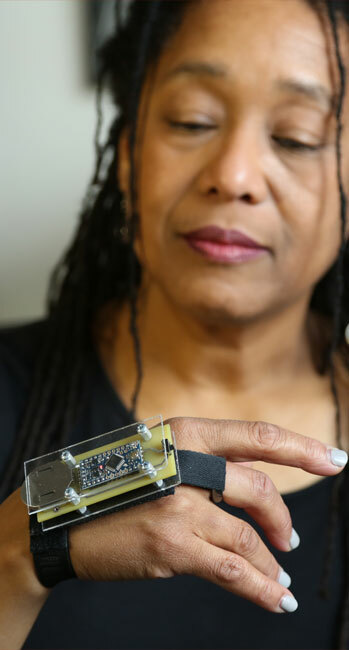 This year I've also been working with long-time collaborator composer/inventor Donald Swearingen, who I've engaged to develop a new gesture controller that employs accelerometer and gyroscopic technology for tracking movement. I've been having a great time incorporating this new instrument into my work. And I still have more collaborative activity to come. I’ve curated four ROOM series concerts for the next couple of months, and I will be featuring the work of a tremendously diverse plethora of artists–including Benjamin Kreith, Phillip Greenlief, and John O’Keefe (Sax Violins Language), Christine Bonasea, Dohee Lee, and Mary Armentrout (Foot and Mouth), Sarah Cahill, Luciano Chessa, and Joe Lasqo (Upright), Donald Swearingen, Jon Leidecker, and Kadet Kuhne (The Body Electroacoustic) – all of whom I will be coaxing into the customary ROOM Series tutti finale on their prospective evenings. This means that, in addition to presenting their solo works, they’ll all have to play with me (in much the same way that all the guests on the 1980s avant garde music TV series “Night Music” had to play with host David Sanborn at the end of each night. Remember that?) 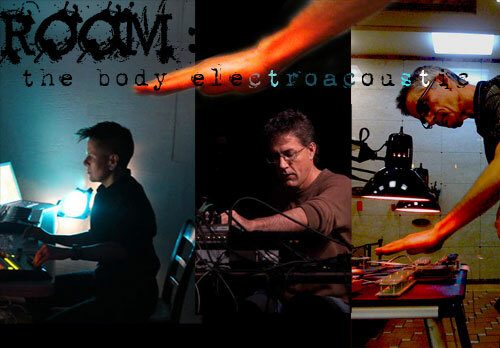 And I’m even counting myself as one of the featured artists on the evening I’m calling “The Body Electroacoustic”. It’s going to be a very full season of work for me, not to mention all the other solo performance activity I have brewing for this summer including Garden of Memory, SOMArts 35th Anniversary show, and MEDIATE’s soundwave ((6)). With so many concerts for you to pick from, it’ll be hard to choose. I’m thinking you should just come to everything. Scroll down for all the gory details! Early in March, I attended the Other Minds Festival where Mark Appelbaum’s Aphasia was a highlight, and I also attended the annual Switchboard Music Festival in April and stayed through all 8 hours of the marathon, as I’m wont to do. I must say, it may well have been the best one they’ve done to date. I was so excited I was live-tweeting the entire time (forgive me!) 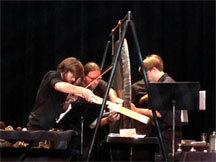 It was a great balance of strong and extremely varied sets by the likes of Splinter Reeds, Gamelon X, Kronos Quartet, and an exciting experimental band called Makeunder. What a day! 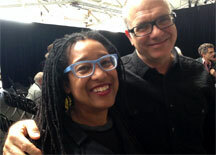 I also went to see Kathy Brew’s lovely design documentary Design is One about the Vignellis (the Italian couple who designed every ubiquitous thing we all unconsciously love–from the NY Subway map to those iconic plastic stacking chairs) at YBCA Cinémateque . And I saw some great docs about Zappa, Nels Cline, and Henry Kaiser at Peter Esmonde and Suki O’Kane’s new music film series at C4NM. 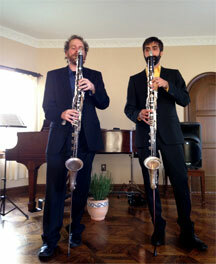 Then there was a lovely music and food pairing house concert–hosted by Locophonic and featuring the bass clarinet duo Sqwonk. I could go on forever about all the great one-off concerts I attended from the Beth Custer Ensemble at Yoshi’s to Del Sol String Quartet with Stephen Kent playing the music of Peter Sculthorpe and Nils Bultman at C4NM. But I don’t want to wear you out. You need to save your strength for all the concerts you’re going to attend in the next few months. Your detailed agenda follows. Pamela Z Arts' intimate avant chamber series is proud to present an evening with playwright John O'Keefe, violinist Benjamin Kreith, and saxophonist Phillip Greenlief. The artists will perform solos and works in various ensemble configurations, and Pamela Z will join them for some duo and tutti moments. 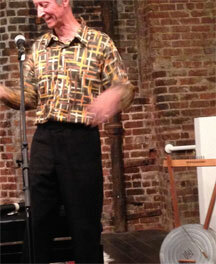 John O’Keefe delivers his prose with such nuance and kinetic energy that his speech becomes a music in and of itself. Benjamin Kreith’s violin sings contemporary music with startling range from searing bites to warm fluidity. Phillip Greenlief’s saxophone speaks with an expansive sound vocabulary and disarming wit. Together and separately, they will fill the ROOM with sonic surprises and infuse each other’s sets with audible interventions and excited utterances. The ROOM Series presents an evening of movement artists who use their voices in their work. (Open foot, insert mouth). Multidisciplinary performance artists Christine Bonansea, Dohee Lee, and Mary Armentrout will fill the ROOM with fancy footwork and fussy mouthwork. The artists will perform solos and works in various ensemble configurations, and then Pamela Z will join them for some duos and a tutti finale. 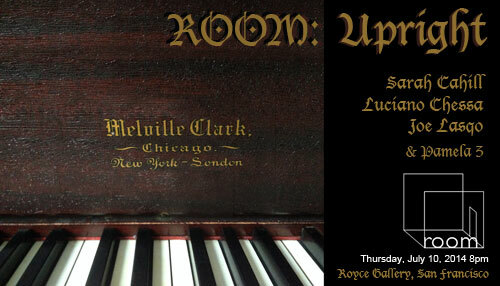 The ROOM Series presents an evening of Bay Area piano virtuosi playing contemporary music on the Royce Gallery's old Melville Clark upright piano (and Pamela Z's Schyling foetal grand). Pianists Sarah Cahill, Luciano, Chessa, and Joe Lasqo, will perform solos and works in various ensemble configurations (2 hands, 4 hands, 6 hands, and 8 hands), and composer/performer Pamela Z will join them for a tutti finale. The ROOM Series presents an evening of electroacoustic music by composer/performers Donald Swearingen, Jon Leidecker, Pamela Z, and Kadet Kuhne, with special guests Suki O'Kane and Giselle Eastman. 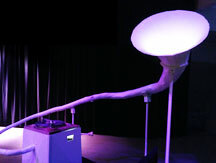 Donald Swearingen translates gesture into sound via a series of sensor-based instruments of his making. 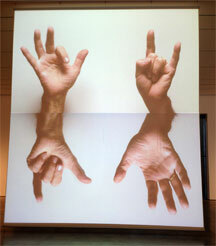 Jon Leidecker inscribes gestures on a tablet to generate sonic events. 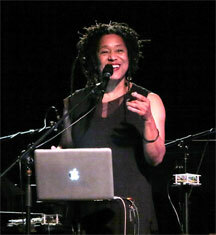 Pamela Z's hand and vocal gestures deliver and transform live and sampled sounds. Kadet Kuhne layers electroacoustic material while Suki O'Kane and Giselle Eastan's dexterous gestures excite sonorities from vibraphone, bass drum, and clarinet. 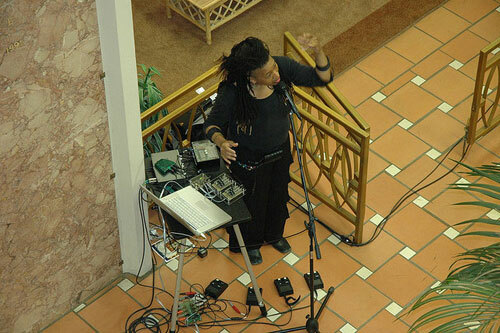 Pamela Z gives solo voice and electronics performances as part of Garden of Memory at Chapel of the Chimes in Oakland, CA. The program will feature continuous simultaneous performances by Bay Area composers, musicians, and other performers presenting a variety of acoustic and electronic music in different parts of the beautiful, Julia Morgan-designed building; the audience is free to move throughout the building during the performances. From 5pm to 9pm. Pamela Z gives a solo performance for voice, electronics, and video and shows installation works. In celebration of their 35th anniversary, SOMArts presents an exhibition called Projected Personae with an opening on the evening of July 19, 2014. Pamela Z will perform during the opening and will show installation works in the exhibition. 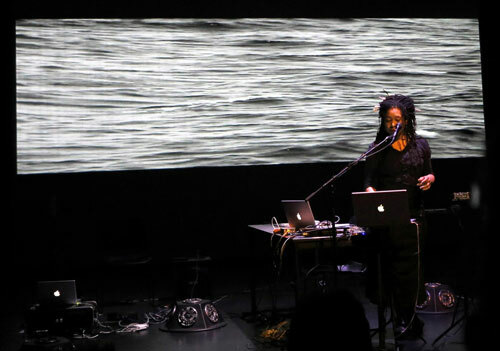 In partnership with the Exploratorium’s Cinema Arts program, Soundwave drops audiences into a special surround sound and cinema event that immerses into the qualities of water. 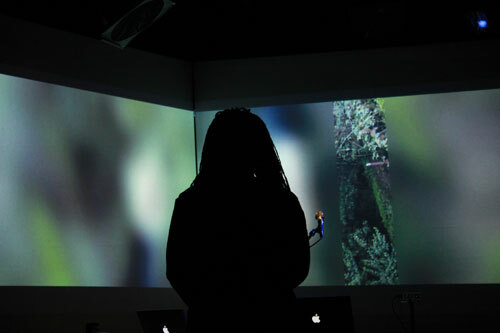 Pamela Z presents ACQUA, a suite of short works for voice, electronics, and video, incorporating live and sampled watery sounds and images, manipulated in real time with gesture activated MIDI controllers and defused in the space – immersing and submerging viewers in an extremely wet room. Duo IN/S’ Condition of Form features multi-channel audio recordings with hydrophones and a 16mm multi-projection filmed on commercial fishing boats out at sea that examine the life and realities on, under and around water. Their piece exposes the adverse impacts on our oceans today, from radiation in the Pacific Ocean to global warming trends altering our fisheries. Film artist Paul Clipson with sound artist Ashley Bellouin present a detailed study of the reflective, associative and rhythmic qualities of water, through an interaction of surfaces, reflections, patterns and structures found in water. Pamela Z gives a full evening solo performance for voice, electronics, and video at the Florida Memorial University Lou Rawls Theatre for the Performing Arts. 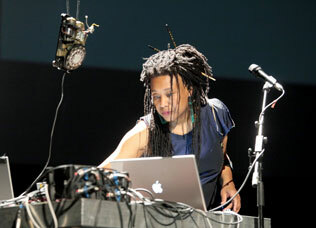 Pamela Z gives a solo performance for voice, electronics, and video as part of the 2014 Approximation Festival in Dusseldorf, Germany. The Approximation Festival, which takes place at the Salon des Amateurs at the Kunsthalle Dusseldorf, is curated by Volker Bertelsmann ( HAUSCHKA ) and Aron Mehzion. 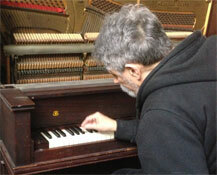 It focuses on piano, electronic music , and other forms of experimental and new music.